Home to the humpback whale, sea lions, sea otters, and swarming with seabird rookeries; Sitka Alaska is also abundant with marine wildlife. Nature lovers will appreciate the ocean-going charters and tours that provide an extraordinary opportunity to view some of the world’s most spectacular sea creatures. For the experience of a lifetime attend the Sitka Whalefest in November and celebrate Sitka’s marine life with special activities and seminars hosted by renowned marine biologists. Nestled amongst the unparalleled natural splendor, Sitka boasts twenty-four attractions listed on the National Register of Historic Places. Learn about the ancestral home of the Kiksadi Tlingit Indians and delve into the rich heritage in the local museums housing rare archives and artifacts. Take a guided tour of the grand historic Bishop’s House and be transported to the Russian colonial era. Walk the site of the 1804 battlefield at Sitka National Historical Park or study the brightly painted totems along the coastal Totem Trail. Stop by the Southeast Cultural Center’s native arts workshop, and chat with woodcarvers, jewelry makers and other gifted artisans. Sitka Alaska is the second largest incorporated city by area in the U.S, with a total area of 4,811.5 square miles, with 2,874.0 square miles being land and 1,937.6 square miles of it, or 40.27%, being water. 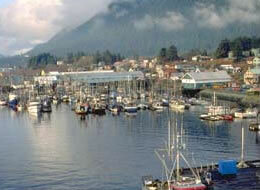 The Sitka Chamber has a great website for more information about the town. Here’s the City of Sitka website. Sitka Alaska was originally settled by the native Tlingit Indians. Old Sitka was founded in 1799 by Alexandr Baranov, the governor of Russian America. Baronov arrived under the auspices of the Russian-American Company, a “semi-official” colonial trading company chartered by Czar Paul I. • In 1802 a group of Tlingit destroyed the original establishment (an area today called the “Old Harbor”) and massacred most of the Russian inhabitants. Baranov was forced to levy 10,000 rubles in ransom for the safe return of the surviving settlers. • Baranov returned to Sitka in 1804 with a large contingent of Russians and Aleuts aboard the Russian warship Neva. The ship bombarded the native’s village for six days, forcing the Tlingits to retreat into the surrounding forest. • Following their victory at the “Battle of Sitka” the Russians established a permanent settlement in the form of a fort. In 1808, with Baranov still governor, Sitka was designated the capital of Russian America. • Sitka was the site of the ceremony in which the Russian flag was lowered and the United States flag raised after Alaska was purchased by the United States in 1867. • Sitka would serve as the capital of the Alaska Territory until 1906, when the seat of government was relocated south to Juneau. The waters around Sitka are famous for the presence of large populations of humpback whales, which sometimes breach and spin before crashing back to the water. Each November the town celebrates “Whale Fest” at the peak of the October-January southern migration of the 40-ton cetaceans, the greatest in Southeast Alaska. Nearby St. Lazaria Island, a seabird haven (part of the Alaska Maritime National Wildlife Refuge) is a home to puffins, petrels, and many other birds. The town’s Alaska Raptor Center treats some 200 injured eagles and other raptors annually. Sitka has an oceanic climate with moderate, but generally cool, temperatures and abundant precipitation. Average annual precipitation is 131.74 inches; average seasonal snowfall is 33 inches. The mean annual temperature is 45.3 °F, with monthly means ranging from 36.4 °F in January to 57.2 °F in August. Only 5.1 days per year see highs at or above 70 °F; conversely, there are only 10 days with the high not exceeding freezing. Extremes range from −1 to 88 °F, on February 16 and 17, 1948, and July 30, 1976, respectively. The best writer you’ve probably never heard of. Straley’s poetic prose weaves a tale as unique as the northern landscape. In his sixth novel in the Cecil Younger series, “Straley’s done the impossible: he’s reinvented the private eye novel.” — The Denver Post. Straley has worked as a secretary, horseshoer, wilderness guide, trail crew foreman, millworker, machinist and private investigator. The cold storage plant is all but abandoned in this tiny fishing outpost, the population is shrinking and change is not in the wind. But Clive is coming back. The most important three species are king and coho (silver) salmon and halibut. Coho are abundant in the area, and King salmon numbers have improved substantially in recent years. The best halibut fishing is further from Sitka. Red snapper, lingcod and other saltwater species are available. Dolly Varden, rainbow, steelhead, and brook trout are found in Sitka area freshwater streams. Depart the Sitka waterfront and immediately enter the lush wilderness of the Tongass National Forest with an experienced Alaska bush pilot. Whether you want to land on a mountain lake, fly over fjords, view glaciers and wildlife or just enjoy the phenomenal and breathtaking beauty of the last frontier. Scheduled services are also available to Prince of Wales, Ketchikan, and Wrangell. Sitka is situated on Baranof Island on the outer waters of Alaska’s Inside Passage, and is accessible only by air and by sea. Sitka enjoys daily jet service by Alaska Airlines from hubs such as Anchorage and Seattle. The Alaska Marine Highway ferries provide year-round service for passengers and vehicles. Sitka is also a popular port of call for most cruise lines that sail the Inside Passage. Once in Sitka, visitors can travel by foot, bicycle, rental car, shuttle, Visitor Trolley or taxi.